Welcome back for the second installment of WHO’S WHO WEEK here at FIRESTORM FAN! 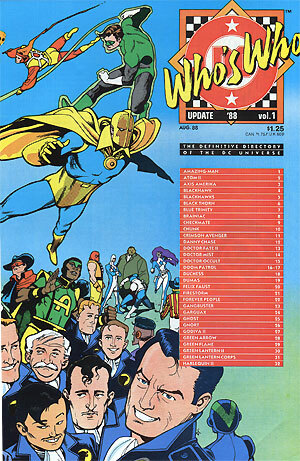 Today we’ll be looking at Who’s Who: The Definitive Directory of the DC Universe Update ’88 #1 (August 1988). This was the third Who’s Who mini-series and featured the “Blank Slate” Firestorm (Ronnie Raymond/Mikhail Arkadin/Professor Martin Stein). Again, it’s not clear who wrote this particular entry, but from the contents page we know it was one of the following people: Mark Waid, Robert Greenberger, or Peter Sanderson. The art in the entry below is by Joe Brozowski & Sam De Le Rosa; they were the artists on the monthly series at the time. 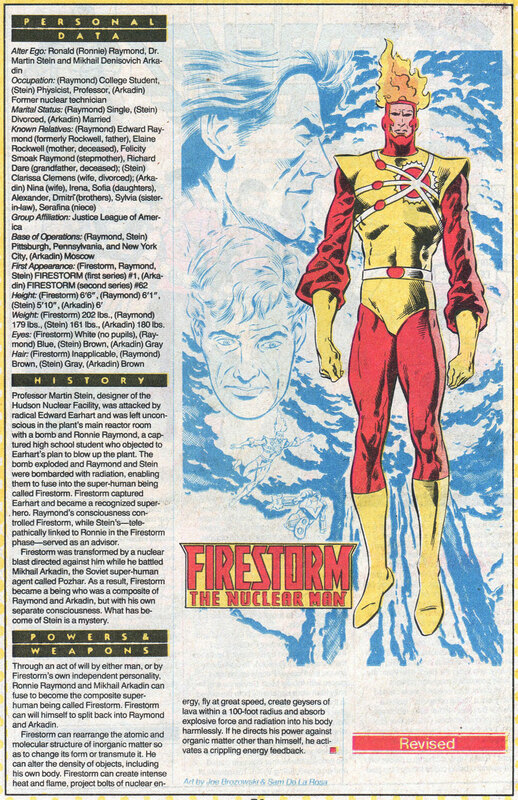 This particular issue of Who’s Who was published around the same time as Firestorm the Nuclear Man (volume II) #74, so information presented was current to that point. Below you will find the cover to this issue of Who’s Who by Ty Templeton. It was a wraparound cover, but I’ve only displayed the front-side as there were no Firestorm-related characters on the back. Come back tomorrow for a look at the elemental Firestorm and a role-playing supplement! Posted in: Comic books, Firestorm #02: Blank Slate (Ron/Mikhail/Stein), Joe Brozowski, Who's Who. Interesting. I never saw this when it came out. Definitely an important snapshot in the development of the character. As for “What has become of Stein is a mystery” is sort of contradicted by his inclusion in the Personal Data, isn’t it?